Tashkent is the lively capital city of Uzbekistan but often gets brushed over by tourists and is used merely as an entry point for the country. People don’t realise there are actually lots of things to do in Tashkent and in their haste to reach the tiles they forget to stop and explore the capital. We were pleasantly surprised by our first two days in Tashkent and ended up scheduling a few more days at the end of our trip once the tile fatigue (a real affliction in Uzbekistan) had well and truly set in. We found Tashkent offered the personality the other cities were lacking and there was more to the city than pristine walkways and manicured gardens (although there is a bit of that too). If you’re travelling to Uzbekistan we strongly recommend that you take a couple of days to explore some of these cool things to do in Tashkent and immerse yourself in Uzbek city life before or after the tourist towns in the rest of the country. For more ideas of where to head to next check out this two-week itinerary for Uzbekistan. This is the Amir Timur statue and the old Soviet Hotel Uzbekistan in the background! One of the best things to do in Tashkent, Uzbekistan is to see the Amir Timur Square with the impressive Hotel Uzbekistan. Chances are the start of you time in Tashkent will start with a visit to Amir Timur Square and the surrounding park areas. The central square of Tashkent shows an epic statue of Amir Timur on horseback and is filled with perfectly manicured gardens. On the edge of the square you’ll find a variety of impressive buildings not least being the truly gargantuan Hotel Uzbekistan which has become somewhat of a icon in the city. If you love Soviet architecture this is a must-see in Tashkent. Visit the Chorsu Bazaar is one of the best things to do in Tashkent, Uzbekistan. We’ve visited bazaars the world over and the Chorsu Bazaar in Tashkent is definitely up to world market standards (if such a thing exists). The market covers many streets, covered alleys and a rather impressive domed market hall. We suggest doing some souvenir shopping here as the prices are cheaper than in the tourist towns of Samarkand and Bukhara. Prices can of course be haggled and you can get things a low as 50% of the original price. See the impressive Minor Mosque is one of the best things to do in Tashkent, Uzbekistan! Ok, there are far more impressive mosques to be seen in Uzbekistan and this one is quite new in comparison but the stark white and its beautiful location next to a river make it a nice thing to do in Tashkent if you have time or are staying at the nearby Jules Verne Hostel. A wander along the river is also a nice break to the city bustle. There are many parks in Tashkent, going for a walk in one of the beautiful parks is one of the best things to do in Tashkent, Uzbekistan. Talking of getting away from city bustle, Tashkent is home to several well-maintained parks and gardens which are great places to wander or sit on a bench and watch the world go by. Basically anywhere in the city which shows up green on the map will be a peaceful park area so head to wherever is on your way and relax in the sun. You will use the Tashkent metro system frequently during your time in the capital of Uzbekistan. The beautiful artwork in the Tashkent metro stations is one of the best things to do in Tashkent, Uzbekistan. This was one of my absolute favourite things to do in Tashkent. Soviet metro systems are famed for being grand and the Tashkent metro system is no exception. These stations look more like art museums or fancy hotel lobbies and each one is centred around a different theme. By far my favourite was Kosmonavtlar a station dedicated to the cosmonauts of the Soviet Union with space themed pillars and mosaics. For more information about the metro system and an overview of the coolest stations read our full guide (coming soon). Have a look what exhibition is on during your stay in Tashkent, because seeing the photo exhibition is one of the best things to do in Tashkent, Uzbekistan. Tashkent has a dedicated photography exhibition hall with rotating exhibitions. I wouldn’t expect leading photo journalism, in fact while we were there the exhibition was a display of photos celebrating the life of the first Uzbek president (read: dictator) who had a questionable human rights record. There was also a painting exhibition from local artists. It’s an interesting stop in the city centre and entrance is free so check out what’s on when you’re in Tashkent. The mosaics in the streets of Tashkent are one of the best things to do in Tashkent! Best things to see in Tashkent, Uzbekistan. Another great feature of communist era architecture is the mosaics on the end of many apartment blocks. These large walls are used for hipster street art in many cities these days but the Soviets were one step ahead and created amazing works of art that you can spot by taking a wander through any of Tashkent’s residential area. There are lots along Bobur street and Mirobad street. Plov is the national dish of Uzbekistan and one of the best things to try in Tashkent, Uzbekistan. To see how they cook massive amounts of plov at the plov center is one of the best things to do in Tashkent, Uzbekistan. Famed as selling the best plov in Central Asia this is a top attraction in Tashkent. To be honest we found plov to be pretty generic wherever we ate it but the experience of seeing it cooked in giant pans with locals queuing up to fill their pots to take home was worth the visit. If your stomach is rumbling after watching the plov making display head inside to the grand dining hall and order yourself a plate (big enough for two people) for a mere 12500 som. There are also salads and drinks available. Go kayaking is one of the best things to do in Tashkent, Uzbekistan. If you’re looking for a more offbeat activity head to Jules Verne Hostel and get them to hook you up with a kayak for a jaunt along the river. Not really something you’d think about doing in a major Asian city but it definitely makes for a fun day out and allows you to see the city from a different angle. There are many good cafes in Tashkent, so getting a good coffee is one of the best things to do in Tashkent, Uzbekistan. Have a look at the ols Soviet books at the bazaar is one of the best things to do in Tashkent, Uzbekistan! The book bazaar is a small stretch of stalls long a leafy pedestrian walkway near the centre of town. Don’t expect a huge variety of literature, especially if you don’t speak Russian but there are some cute little shops selling a variety of books. At one end there are also a few decent souvenir stalls and mixed in between are people selling old medals, coins and other collectors items from a blanket on the ground. If your wandering the city this is a good spot to have a browse on your way through. Visit the history museum is one of the best things to do in Tashkent, Uzbekistan! Ok confession, we didn’t actually visit this museum as we’re not huge museum people. But if you’re interested in learning a bit more about the history of the country, including many of the sites you’ll be visiting in the other cities then this museum is worth a visit. Entrance costs 10,000 som. The orthodox church in Tashkent is an impressive building and one of the best things to see in Tashkent, Uzbekistan! In contrast to the many mosques and tiles across the country this church shows a different form of architecture and is a beautiful stop in the city centre, particularly at sunset. 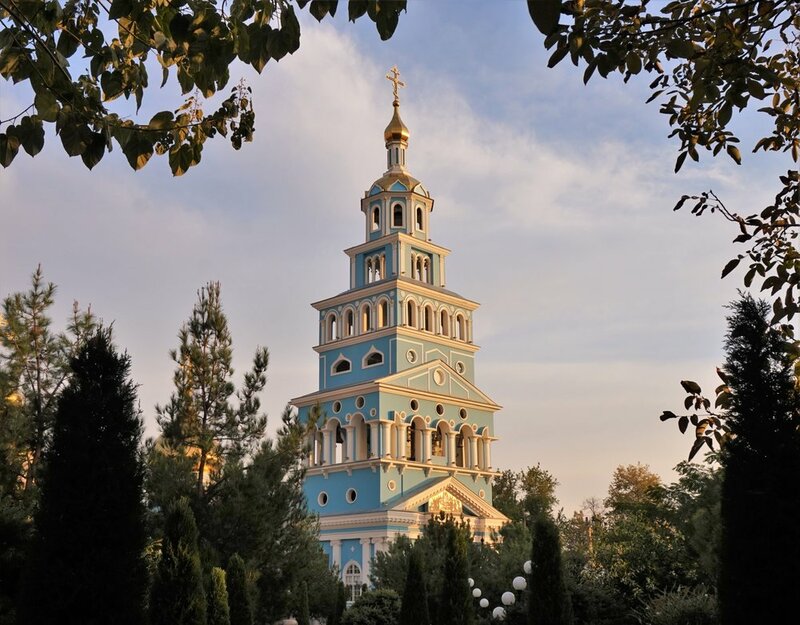 A tall church spire painted in light blue is surrounded by sparkling gold onion domes and is an icon of Russian influence on the city. You can take photos from the outside but not within the grounds, entrance is free. A lot of buildings are lit up at night, this is definitely one of the best things to do in Tashkent, Uzbekistan! Uzbekistan like to show off, whether it’s with high speed trains, lavish decoration or gigantic buildings the country are into displays of wealth and grandeur. Tashkent at night is no exception. The entire city seems to com alive with light from the rainbow lit underpasses (definitely not in support of gay rights) or the huge Uzbek flag lighting the side of a building you can find all kinds of light displays and flashing masterpieces on any night of the week. For a great budget option with both dorm rooms or private rooms we stayed at both Topchan Hostel and Jules Verne Hostel. Both were affordable, clean and had helpful staff. The WiFi worked well at Topchan which is very uncommon for Uzbekistan so if that’s important to you check it out here. Otherwise Jules Verne is a great option too and is a bit more private and has better breakfast – book now. For a true Soviet experience, treat yourself to a room at the enormous Hotel Uzbekistan right in the Central Square. The building itself is impressive enough but the rooms are well appointed and the location can’t be beaten – check prices here.